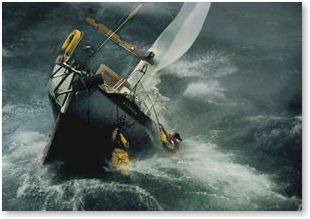 Capable sailors with maps, GPS, and not too difficult wind conditions run aground. Right on time for our regular afternoon 'Martini Time', the wind calmed down enough to shake out one of the reefs. Later in the evening, we were able to take down the storm jib and roll out parts of the Genoa again. We had tagged a number of times and now were on our final leg out of the reef area. The wind was shifting back to North-East and we suddenly were able to aim higher (further to the right) than anticipated. A quick check on the GPS and the map showed that we still should be able to clear the reef. We calmed down, ready for a good rest after a long day of bouncing through rough seas. The North-East corner of Honduras was named 'Cabo Gracias a Dios' by Columbus who was thankful to God at this point of his journey. He had come from the North-West, fighting against an Eastern wind. By finally rounding the cape he was able to swing South and sail a more favorable course. We had just cleared the cape in the other direction. It was at about 10 at night on January 12. Steve had gone to sleep, I had just cleaned up the kitchen and was getting ready to rest when I heard a soft unfamiliar scratch noise. Maybe a wooden branch...? Before I was able to finish the thought, an aggressive laud and longer SCRAAATCH shook the boat. It sounded like we just had been stroke by flash light. A second later I was on deck, dis-engaging the wind-vane, and pushing the rudder as far to starboard as possible. Steve was up a second later. I could see the frightening horror in his eyes. We had just hit a reef! The boat slowed down, still hitting the shallow ground underneath us and screaming continuously. Steve took the rudder while I rushed down again to check our position and the location of the closest reef. I found 'Banco del Cabo Falso' right next to our position. We should have passed it on its South-West side. "Go left! Port! West! ", I yelled up, but it was already too late. We were in 3 foot deep water. 'Solitaire' draws 7.6! We were stuck at N 15.30, W 82.08! There were braking seas all around us, the wind was screaming, our sails flapping, as 'Solitaire' was leaning more and more to port. Were we about to sink? This was not a situation anymore that we could handle safely. We decided to switch on the EPIRB and get ready to abandon ship. 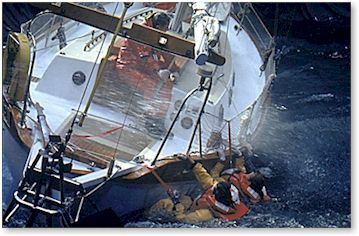 The Emergency Position-Indicator Radio Beacon (EPIRB) sends out a signal that is being picked up by satellites and then transmitted to the US Coast Guards. We knew that -if the EPIRB worked- the Coast Guards would pick up the signal and our position, they then would verify by phone with Steve's sister that this could really be an emergency before sending out a plane to scout the area. We calculated that we might see a plane the next morning - if the EPIRB worked. While I was getting the emergency bag ready, Steve tried to contact other vessels with Mayday calls via VHF and short wave. We never reached anyone. 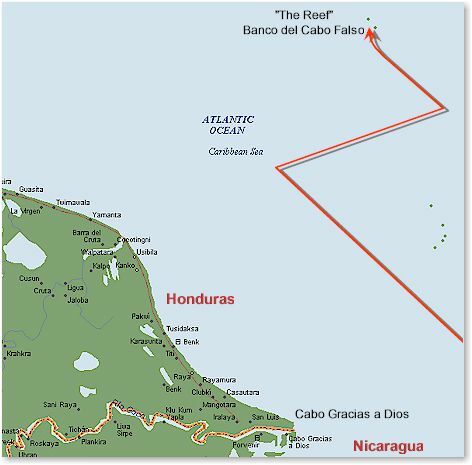 An isolated area, 30 miles off the coast of Honduras. There was just us and the reef. 'Solitaire' was leaning heavily to port. Waves were crashing against us from the right, lifting the ship a bit, and then moving her over the rough reef. We heard scratching and cracking noises inside of the cabin while the waves were crashing against us. The emergency bag was ready: utensils, food, water, compass, hand-held GPS, hand-held VHF, everything we needed for a survival out on sea. 'Solitaire' was still rocking in 3 feet deep water, lying on her side. Were we moving? Would we fall off the reef at its end and sink? We didn't know. Outside it was a rough and totally black night. Clouds and no moon. There seemed to be time remaining. Both of us rushed through our personal gear to pack the most essential. What to take? Warm clothing, rain gear, personal belongings, passport, ... Would I have to leave the rest behind? Still no answer from anybody on our Mayday calls. The next minute, the board power went down. We were completely in the dark. Were the batteries getting wet? Were we taking water anywhere? In the fading light we checked from the inside what we could see of the ship's left side. 'Solitaire' still seemed to hold out. We also had the impression that we were not moving away from our position. Aside from the shaking by the waves, we seemed to remain on the same spot on the reef. But for how much longer? 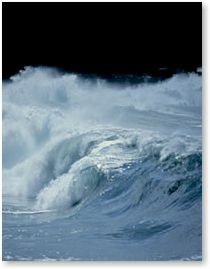 What if the wind and waves picked up? We decided to get the life-raft ready. Just in case. The rule is to stay with the ship as long as possible. How much longer would that be for us? Too many questions to which we didn't know the answers. We threw the raft container in the water and my third rip inflated it properly. A little island with a roof - barely big enough to take on two people. We tied it to our ship and transferred our gear into the raft. This was all we could do. Now, we just had to wait. We climbed back into the cabin and tried to find comfortable positions at 45 degrees angle. It was now dark inside as well. Only our EPIRB on deck was blinking. We listened to wind and waves. Each cracking and scratching from 'Solitaire' hurt like it was our own body. She was screaming for help - yet, we couldn't do anything. Would we be able to help ourselves? It promised to be a long, long night. Steve stretched out on the port bench. I was not able to close an eye and kept hoping that this was just a bad nightmare out of which I hopefully would awake soon.